After an infamous snub from the College Football Playoff in the 2014-2015 campaign, TCU entered last year with a chip on their shoulder. The Horned Frogs were led by Heisman hopeful Trevone Boykin at quarterback, possessed All-American candidates Josh Doctson and Kolby Listenbee at receiver, and still had some great talent defensively. However, injuries struck throughout TCU's roster, crippling an already young defense and even impacting their explosive offense. A 20-point loss to Oklahoma State hurt TCU's Playoff hopes and a loss to Oklahoma effectively killed any huge postseason plans. While the two regular season losses were relatively disappointing, TCU responded with an epic comeback against Oregon in the Alamo Bowl without Boykin, who had been suspended for his role in a bar fight days earlier. That epic bowl victory should help give the Horned Frogs some more momentum entering 2016. While Boykin and many members of the offense are gone, the defense should step up in a big way this season, and there remains enough talent that TCU should stay in contention for a Big 12 crown. Backfield: There was no football player more dominant than Boykin over the past two years. A former receiver, Boykin locked down the job and excelled under co-offensive coordinators Sonny Cumbie and Doug Meachem. Boykin had 3,574 passing yards and 31 passing touchdowns, while also running for 612 yards and nine more scores. His departure obviously stings, but the cupboard at QB is not completely bare. Texas A&M transfer Kenny Hill arrives without a ton of fanfare, but plenty of potential. The starter directly after Johnny Manziel, Hill showed how good he could be at times, passing for over 500 yards on multiple occasions, and 23 touchdowns. When the Aggies began to struggle, Hill was blamed and lost his job to Kyle Allen, ending his time in College Station. Hill's big arm and large frame is a great fit for Meachem and Cumbie's scheme, and he won't have the relentless pressure he had on him at A&M. Hill will not be handed the job, however; the junior will have to compete with sophomore Foster Sawyer, a local product. Sawyer possesses wonderful size (6'5") and great mobility. Both are great talents, and TCU will be sure to use them correctly. The Horned Frogs will also have to replace their feature back, after Aaron Green graduated. Green ran for 1,272 yards last year, along with 11 touchdowns. He consistently moved the chains and always had big runs in store. His absence should push the player who finished off third in rushing (behind Green and Boykin), junior Kyle Hicks, to the forefront. Hicks showed loads of promise a year ago, but ran the ball just 56 times. TCU does have a very balanced offense, so Hicks could get upwards of 250-plus carries, and it will be interesting to see how he handles that type of workload. Hicks finished off with 262 yards and three scores last year, while also showing he could catch the ball pretty well out of the backfield. Seeing those numbers skyrocket should be highly likely, considering the increased workload. Fellow junior Trevorris Johnson should act as a great complement to Hicks. Johnson ran for 262 yards as well last year, but one ten less carries. While Hicks does most of his damage because of his size and power, Johnson is more dangerous and agile. The combination of Hicks' power and Johnson's explosiveness will give TCU plenty of versatility to work with. Beyond those two, expect sophomore Shaun Nixon and possibly even newcomer Darius Anderson to see some action. Nixon ran for 66 yards on 16 attempts a season ago, while Anderson has a bright future as three-star addition. Receivers: Not only do the Horned Frogs lose two of their top three receivers, they lose one of the nation's premier talents in Josh Doctson. Doctson put on a clinic a year ago, recording 1,326 yards and 14 touchdowns. He could have done even more damage, but he was limited towards the end of the year by a wrist injury. He is off playing in the NFL, and TCU will greatly miss his insane reliability. Kolby Listenbee also graduated, leaving a big void as well. Listenbee was productive, with 597 yards and five touchdowns. His most important trait was his speed and deep threat ability, as he averaged nearly 20 yards a reception. A track star, Listenbee worked very well with Boykin, and opened things underneath for Doctson and the rest of TCU's offensive talent. Those two losses should put more pressure on sophomore KaVontae Turpin, but he should handle it just fine. Turpin came on to the scene in a big way last season, picking up 45 catches, 649 yards and eight touchdowns in his first year with the team. Turpin proved he was an outstanding athlete, changing games every time that he touched the ball. He was still prone to mistakes and drops a year ago, but those issues should decrease with more experience and comfortability in the TCU offense. Joining Turpin should be a strong cast of playmakers. Senior Deante Gray will have the chance to have a big year after taking a redshirt a year ago to recover from knee surgery. 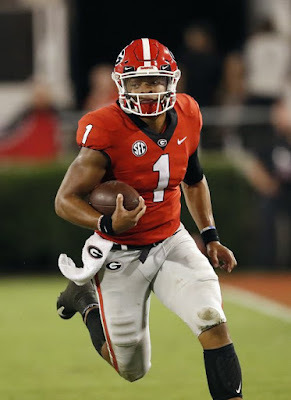 Gray proved he could break open games in 2014, with eight touchdowns. Sophomore Jaelan Austin and junior Emanuel Porter should take much bigger steps this year. 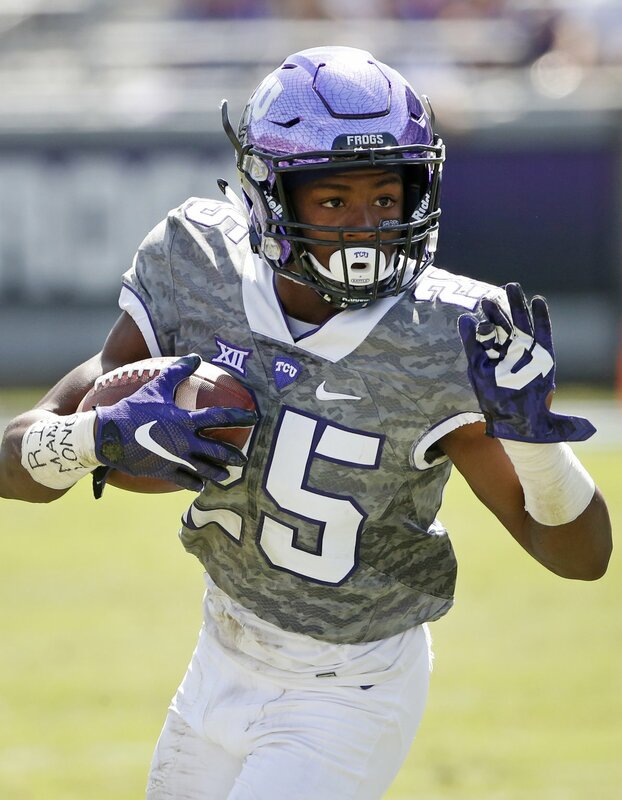 Porter has showed flashes of stardom throughout his time in Fort Worth, while Austin was good in limited action a season ago, with 10 catches for 137 yards. Junior Ty Slanina is another guy that should get more playing time this year, and the junior possesses immense potential. 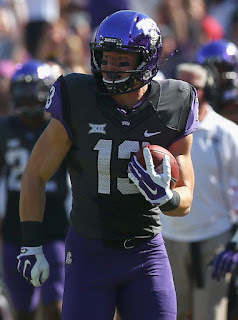 Tight end could be an issue for the Horned Frogs, Junior Charlie Reid is the only returner with much experience, but he had just three receptions last year. Newcomer Artayvious Lynn could possibly push for playing time as three-star prospect from New York. Offensive Line: While the losses of Boykin, Green, Listenbee and Doctson are going to be very hard to replace, there will be no transition tougher for TCU than replacing the four starters gone on the offensive line. The Horned Frogs didn't have any transcendent talents on the O-Line, but it was a solid and productive unit. While TCU's offense puts plenty of emphasis on their talent at the skill positions and their speed offensively, their offensive line is skill obviously pretty critical to their offensive success. There is some experienced talent remaining, namely guard Matt Pryor and center Austin Schlottman. Both were thrown into the starting lineup a year ago due to a rash of injuries and played very well. Pryor, a junior, offers great size and is an established run blocker that should lead the charge for Johnson and Hicks. Schlottman will provide great stability to the interior of the unit, and is great working with quarterbacks out of the shotgun, where TCU runs nearly all of their plays. The tackle spots should be in pretty good hands, as a number of veterans return to lead the way. Right tackle Aviante Collins enters his senior season as a great pass blocker, while junior Joseph Notebloom is the favorite to lock down the left tackle spot. Joining Notebloom on the left side of the unit should be Patrick Morris, a junior with amazing talent. The depth in the unit isn't terrible, but we could still a couple young pieces come in and see some action. Gary Patterson and staff recruit nationally as well as anybody, and went up into the Northeast multiple times in this year's class. 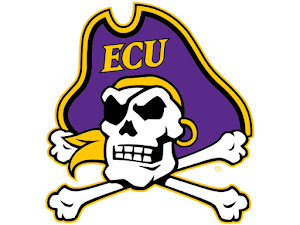 Three-star Lucas Niang comes down from Connecticut as a solid piece, while fellow offensive linemen Chris Gaynor was a more local find (Dodge City, Kansas). Defensive Line: Few programs find and produce as much talent on their defensive line as TCU. Patterson specializes in finding and developing defensive linemen, and he has plenty of fantastic talent in the front seven this season. Leading the way is senior Josh Carraway, who has the chance to be one of the Big 12's elite pass rushers. Carraway had 10.5 tackles for loss last year and added eight sacks on top of it. Carraway uses his great size and agility to make every type of plays, being a disruptive pass rusher and as a run defender, with 46 tackles. While Carraway locks down one defensive end slot, expect fellow senior James McFarland to make plays on the other side. McFarland was expected to have a big 2015 after earning Peach Bowl Defensive MVP honors in 2014-2015, but he missed the entire year due to injury. McFarland has proven time and time again that he is a disruptive presence, even a guy that can help in coverage (he had an extremely impressive interception in that Peach Bowl victory). In the interior of the line, the Horned Frogs will miss Davion Pierson, one of the better tackles in the Big 12 a year ago. Pierson had 37 tackles and 6.5 TFL, but TCU should be able to find some pieces to replace that production. Yet another senior, Aaron Curry should put together a big year. Curry had 41 tackles himself a season ago, and is a great pass rusher, with three sacks a year ago. Curry isn't huge, but his speed and athleticism is tough for slower offensive linemen to stop. There is no clear candidate to replace Pierson at the tackle spot next to Curry. Sophomore Breylin Mitchell has the chance to be the stater, but a number of other players will compete with the young linemen. Junior Chris Bradley had a solid year in 2015, but doesn't have as high of a ceiling as Mitchell. Big things are expected for true freshman Isaiah Chambers, one of the highest rated prospects in the 2016 recruiting class. Chambers is a four-star playmaker out of inside the state who Patterson managed to keep away from all the other Texas schools. Defensive tackle Ross Blacklock is another guy that TCU managed to keep away from a number of other powerhouses in the area, and the three-star prospect will produce right away. Linebackers: There was no position group as young on TCU's roster as the linebacker corps where they missed their undisputed leader, Paul Dawson, and a number of other pieces. Patterson and defensive coordinator Chad Glasgow had to lean on a lot of young freshman and it was very understandable that the unit struggled. The unit will still be very youthful again in 2016, and won't play too critical of a role in the 4-2-5 defense. Junior Travin Howard had a huge 2015, and he should be in store for bigger honors this season. Howard recorded 107 total tackles, and 9.5 tackles for loss, making plays from sideline to sideline. Howard also proved that he was quite the hitter, forcing three critical fumbles for the Horned Frogs. The likely starter alongside Howard in the unit is sophomore Montrel Wilson, who will lock down the middle linebacker spot. Wilson was also solid last season despite being very young, picking up 60 tackles. He proved that he had a nose for the football last year, but still is improving at tackling in space, an important trait to have in the spread-orientated Big 12. Junior Sammy Douglas was little used last season, but he is a veteran that knows the system and could fight for action. Redshirt freshman Semaj Thomas is a young guy that could see an increased role and has breakout potential. The big newcomer to the group is going to be four-star recruit Tyree Horton who comes in from Highland, Kansas. Horton is a linebacker that brings fabulous athleticism and playmaking ability to the equation. Secondary: TCU will desperately miss one of their top defensive leaders last year, Derrick Kindred. The safety did it all for the Horned Frogs a year ago, recording 86 tackles, two interceptions and forcing two fumbles. While TCU will certainly miss that production, the defensive backfield could still be a considerable strength, with solid experience and talent returning. Junior cornerback Ranthony Texada has to be seen as one of the stars of the unit, even after missing the entirety of 2015. Texada is a corner with terrific ball skills and coverage ability, and opponents will be wary about passing near the veteran. Also back in the secondary is junior Nick Orr, a safety that can help out in a variety of ways. Orr had 50 tackles last season, and also showed he could support in coverage, with nine pass deflections. Senior Denzel Johnson is yet another guy that helped out quite a bit a season ago, and the Horned Frogs should lean on the strong safety. Johnson is a terrific run defender, racking up 79 tackles and 13.5 tackles for loss last season. Glasgow loves to let Johnson get out and blitz, and the defensive back, gifted with great size and long arms, is awfully disruptive. Safety Kenny Iloka was yet another player that lost his 2015 due to injuries, and should come back in a big way. Iloka was great in 2014, and the Horned Frogs will love his coverage skills. He'll compete with sophomore Niko Small for one of the remaining safety spots. The other cornerback spot opposite of Texada is a major question mark, as there isn't any favorite to lock down the position. Defensive back Markell Simmons is the big incoming freshman in the Class of 2016. Simmons is a highly rated prospect who comes over from Arizona, while three-star Innis Gaines was a steal from inside the state. One of the most interesting pieces to the recruiting class is Sewo Olonilua, the highest rated prospect in TCU's class, according to 24/7 Sports. Olonilua can do it all, and is listed as an athlete. He is a talented runner and could find his niche as a running back, but also has the potential to be a very good safety, and the Horned Frogs could use his great range in their secondary. Special Teams: TCU said goodbye to longtime kicker Jaden Oberkrom this past season, and his departure hits significantly. Oberkrom was extremely consistent, knocking down 21 of 25 field goals and connecting on 59 of 60 extra points. A new punter will also have to emerge after Ethan Perry graduated. Injuries and youth hurt TCU significantly last year, but they still managed 11 victories. While life without Boykin and Doctson will be no breeze, Gary Patterson is one of the nation's better coaches, and he has an immensely talented roster. The offense still has the potential to be dangerous, and they should be very stout defensively, headed by perhaps the Big 12's most complete pass rush. Other good news for TCU is the fact that unlike much of the Big 12, their schedule is not tremendously back-loaded. Their toughest opponents, Oklahoma and Oklahoma State both come in relatively soft parts of their schedule. They get Oklahoma in between SMU and Kansas, and Oklahoma State after Baylor, which isn't absolutely terrible. Also, outside of Arkansas, their non-conference slate is very manageable. It may be an odd transition period for the Horned Frogs, but they should not be overlooked. Both Oklahoma schools are favorites in the Big 12, but the Frogs should certainly contend. If their offense can iron out their issues, TCU could very well challenge for a New Year's Six bowl berth.